Happy Halloween, 1910! It’s that night when young pranksters are afoot and angry men blast away at them with shotguns. The last time we looked at Halloween trends was for the year 1907, when there were at least seven fatalities nationwide. Only two died in 1910 but that may have been just dumb luck – there were three accounts of men firing shotguns into groups of boys involved in mischief. One young man was hit in the neck (it wasn’t reported whether or not he later survived) and another had forty buckshot pellets removed from his body. It’s likely there were other incidents like those; non-fatal shootings were local news only, and those three cases were found in the small sample of newspapers currently available through the Internet. The papers show the country was in a far better mood than that earlier Halloween, which is no surprise considering the 1907 Bank Panic happened just a couple of weeks before the holiday, and many were fearing it was the start of a great depression (Press Democrat headline one week before 1907 Halloween: “FINANCIAL SITUATION IS PANICKY ALL OVER COUNTRY”). But in 1910 jolly Halloween parties were reported everywhere, and many schools and churches threw parties for kids, a transparent ploy to corral the little hooligans. Pranks were mostly the same as from earlier years. (The whole notion of “trick or treat” as barter against vandalism apparently did not evolve until around 1927.) It was still popular to steal front gates from homes and hoist them high into trees; wagons and buggies were taken apart and reassembled atop a roof. There were regional variations, too. In the Midwest it was apparently common to dump a load of feed corn on someone’s porch, creating a cleanup mess (think of it as the old-time version of TP’ing trees). The police in Indianapolis were on the alert for vandals throwing putty at passing automobiles. And in Provo, Utah, which became “dry” at the beginning of 1910, prohibitionist pranksters painted the word “blind” and a cartoon of a pig outside the speakeasies (here’s the meaning of “blind pig” for those unfamiliar). Some pranks also involved a “tick-tack,” about which some deeper research was required. Completely forgotten today, this little noisemaker was incredibly popular at the turn of the century and easy for even a small child to make. Take an empty thread spool and notch teeth on the top and bottom to make the ends into something like a gear. Stick the spool on a pencil and wind string around the core. Pull the string and quickly press it against the outside of a window. Anyone inside the house would be startled by the very loud rat-a-tat-a-tat-a-tat sound that results. 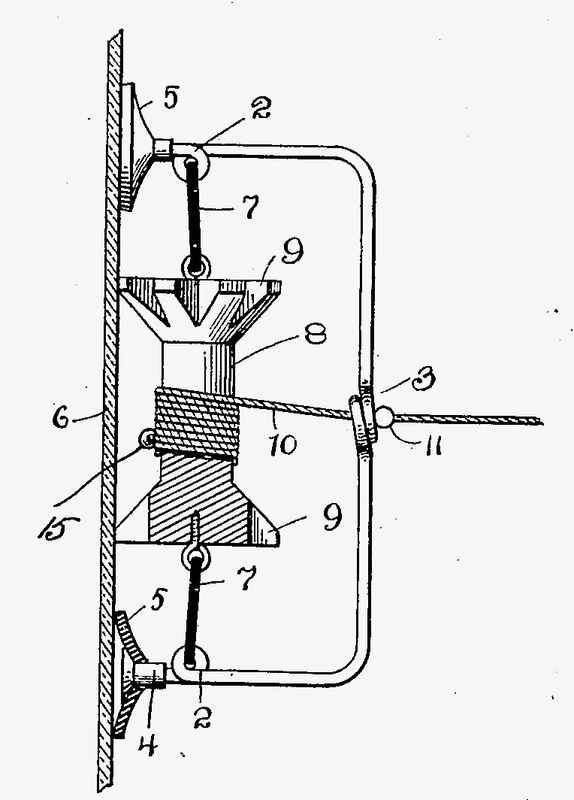 There were more complex versions including a couple of patented gizmos – the image shown at right is from a patent that included suction cups to attach to the window and a metal spring. You can find directions for a rubber band cranked tick-tack in the 1914 book, “The American Boy’s Workshop,” which also includes directions in how to trap a skunk, build a raft (“surely you can find four good stout logs and cleat them with pieces of scantling firmly spiked on”) and several ways to put your eye out. But a tick-tack was not intended to be your everyday ratchet noisemaker; it was meant to terrorize people in the comfort of their home. And so one of the 1910 deaths came to be a sickly two year-old boy in Denver, who had a seizure and died after he was startled by the racket of a tick-tack on his bedroom window. The most interesting pranks, however, are the ones that remind us how different things were a century ago. In the town of Jackson (Amador County) school was cancelled because someone stole the clapper in the school bell, and as everybody knows, school can’t be held unless the school bell rings. Another school cancelled classes because wiseguys broke into the school, led a cow to the second floor and left it there. This was a two-fer; not only was school called off because of the janitorial mess, but it’s also impossible to lead a cow down a set of stairs – how they got it out of the building is anyone’s guess. And then there was the teacher in Duncan’s Mill who found her buggy on the top of the barn the morning after Halloween. She demanded her students have it ready for use by the next day and come the following dawn, she awoke to find her buggy still on the barn but now with a goat hitched into position. Anythin’ else we kin do for yer, Ma’am? Some of the practical jokers at Duncan’s Mills had some amusement Hallowe’en and since at the expense of Miss Ethel Piezzie of this city, who is teaching in Ocean district, and living at Duncan’s Mills. During Hallowe’en night the buggy in which Miss Piezzie drives to and from he school daily was taken up on top of the barn, and her horse taken out of its stall and an old plug put in its place. When it came time to go to schools, Miss Piezzie was compelled to hire a buggy. Dire threats were made by the teacher as to the results to the jokers unless her buggy was ready for use on Wednesday morning. When Wednesday morning came there was the buggy still on the barn, but hitched in the shafts was a goat which had been secured during the night and taken aloft for the purpose. The affair has created much amusement to all but the unfortunate teacher.